Based on historical records, ancient mountain was not just a monopoly of Lake Toba. One of the other ancient volcano has a caldera that we know as sand Tengger caldera. Caldera is the center of the explosion that more than 2 kilometers in diameter, while the crater is the center of the eruption of a diameter less than 2 kilometers. According to the Head subfields Volcano Observation Center Directorate of Volcanology and Geological Hazard Mitigation Geology Ministry of Energy and Mineral Resources Agus Budianto, when contacted from Jakarta on Wednesday (11/24/2010), Mount Bromo in East Java is the mountain that appears due to the activity of Mount Bromo ancient in the past. Not yet clear how many tens of thousands of years ago these ancient volcano erupted. "Kalderanya is the caldera of sand that we know today. 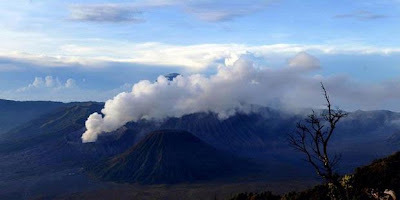 In the vicinity of the caldera area of sand and then emerged a few mountains in addition to Mount Bromo, among them is Mount Batok and Mount Widodaren. Caldera model like this is very common in Indonesia. This comes from a huge mountain, megavulkano. In addition to Bromo caldera and the caldera of Lake Toba, also there is the caldera of Krakatoa which gave birth to Mount Anak Krakatau, which gave birth to the caldera of Mount Batur Batur existing child, and caldera Maninjau to Mount Maninjau, "said Agus. Lake Toba Caldera, which erupted about 70,000 years ago, according to him is the result of volcano activity and tectonic activity. Of note is the Chronicle Ngayogyakarta, Mount Bromo erupted on December 28, 1822 and only stopped in January 1823. In the 1822 eruption of Mount Merapi as well (Kompas Yogyakarta, 19/11), Mount Slamet (Central Java), Mount Kelud (East Java), and Thunder Mountain (West Java). In the same year five mountain erupted. While based on the Basic Data book published in 1979 Indonesian volcano, Mount Bromo recorded eruption in 1822 along with the Mount Merapi, Mount Galunggung, and Mount Lamongan. Book catalog reference Indonesian volcanoes with eruptions in historical time is compiled from various references that existed since the colonial era. Based on data in the book, Mount Bromo has erupted 43 times-plus the eruption in 2004. However, the site mentions http://geodesy.gd.itb.ac.id has erupted 50 times since 1775. Notes of the Basic Data Volcano Indonesia, is the oldest eruption in 1804. According to Neumann van Padang (Indonesia Volcano Data Base, 1979) in the sand caldera of Tengger Mountains there are seven centers of eruption in the two paths cross, one on the east-west direction and the other line northeast-southwest. Mount Bromo is in the axis northeast-southwest. This mountain is the only one still active volcano of Mount Bromo Ancient heritage. The crater in the east-west lines reached 600 meters, while the crater in the north-south diameter of 800 meters. A railroad show, moving in the direction of eruption centers north. In March 1983 formed a lake in the crater. In history, the eruption of Mount Bromo no lava flow. Abu vulkaniknya been recorded damaging plantations surrounding the eruption that occurred in 1915 and 1948. Longest eruption occurred in 1842, namely on 24 January to June. From the same site written last eruption occurred on June 8, 2004 and actually ended on June 9, 2004. Major eruption occurred only about 20 minutes. The eruption is freatik, forming a column of ash up to 3,000 meters altitude above the lip of the crater. Material ejected ash and gravel up to a radius of 300 meters (compared with Merapi ash that can be spread through the clouds heat up more than 4 kilometers). The data contained on the website of the Scientific Group http://geodesy.gd.itb.ac.id of Geodesy Faculty of Science and Technology Earth ITB about Bromo Volcano Deformation Monitoring with GPS, type-A volcano is the youngest volcano in the area of the caldera Tengger, namely Mount Widodaren, Chair, Segorowedi, and Shell. Tengger Caldera itself in the site mentioned measuring 9 km x 10 km, surrounded by steep cliffs with a height of between 50 meters and 500 meters. Mountain range in the caldera of Mount Tengger volcanic rock surrounded by ancient-called by Agus as Mount Bromo Antique.